Ranju has tears in her eyes as she reflects on the devastation she has experienced. The 26-year-old widow had just lost her husband from sickness two days before the floods came. She then saw her house washed away in the north-eastern Indian state of Assam which has been particularly hard hit by the worst flooding to strike South Asia in more than a decade. More than 40 million people have been affected by the seasonal monsoon floods that have swept through India, Nepal, Bangladesh and Pakistan. 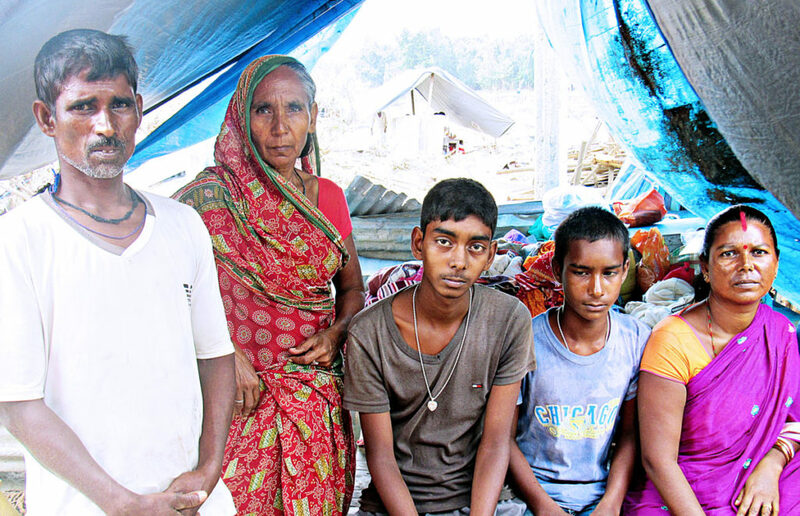 Ranju never imagined she would lose her husband or her home. “We wanted to raise our daughter by giving her a quality education but our dreams remain a dream,” she said. Janardhan and his family. They climbed on the roof of their house to escape floodwaters. Now the young widow and her 18-month-old daughter live with her late husband’s relatives in the village of Dezoo Chapori in North Lakhimpur. She appealed for aid and Caritas India is providing them with emergency relief to help her get on her feet again. “I will use this money to get my daughter into school and to reconstruct my house” she said. Millions of people across the region have been affected by tragedy and loss. Janardhan Sharma, 40, from Sunsari in southern Nepal lost his eight-month-old baby girl in August when he and his family climbed on the roof of their house to escape surging floodwaters after the nearby river Tenga broke its banks. Janardhan Sharma is the only breadwinner for his family and has no land or livestock. But he and his wife are struggling to overcome the loss of their child. “Life ceased for a moment,” he says. “My wife is suffering from high fever. She vomits and gets unconscious from time to time. She is facing psychological trauma due to loss of our baby. Abaidul Haque, 54, is a poor farmer from Harindhora village in Jamalpur, Bangladesh. His house was washed away under the surging flood waters so he and his children and elderly parents were forced to take shelter on a small boat for 10 days while they were continually pounded by torrential rains. He is the family’s only breadwinner and the outlook is bleak. Millions of people have been left homeless from the monsoon floods that struck India, Bangladesh and Nepal and the death toll has climbed above 1,200. All three countries suffered flooding during the June-September monsoon season. Caritas India is reaching out to some of the worst affected areas in the states of Bihar and Assam. Caritas is also working in Nepal, Bangladesh and Pakistan to evacuate victims and provide urgent water, food and shelter. Livelihoods have been destroyed, homes have been washed away and up to 18,000 schools are estimated to have been damaged or closed. There are also concerns for the health and sanitation of survivors. Flood survivors are particularly vulnerable at this time amid fears that diseases like cholera and dengue fever may take hold. In the Indian state of Assam alone 1.1 million people have been affected in 24 districts and thousands are taking shelter in nearly 350 relief camps. Bihar and Uttar Pradesh have also been severely hit and heavy rain is continuing to wreak havoc on farms, businesses, schools and homes. Caritas India has deployed staff to the flood affected areas. It plans to support more than 40,000 people in Assam alone providing clean water and hygiene kits for 5000 households, cash transfers for 1600 families and shelter for 4000 households as well as psychological support for 3000 individuals. Staff from Caritas India are also providing advice on safe hygiene practices during relief distribution to help protect them from life threatening illnesses like diarrhoea. In Bangladesh, nearly millions of people have been affected by the flood. Although the government has provided rice, dry food and cash to some of the survivors, there are many still in need. 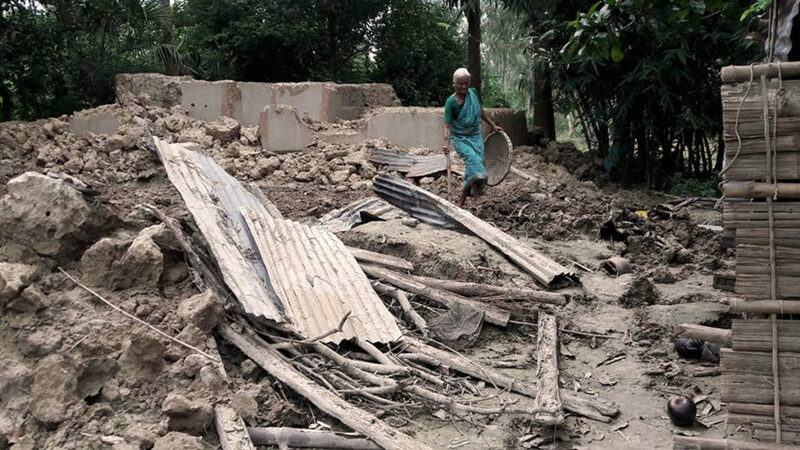 Seventy-five-year old Budhan Linda also lost the mud-built house she shared with her daughter in Saldana, a remote village in the Naogaon district of northern Bangladesh. An agricultural labourer, she has no work as the fields have been destroyed by the floods. A widow for the past 15 years, Budhan Linda is now living in a temporary shelter and needs Tk. 30,000 ($US375) to rebuild her home. Caritas is looking at providing unconditional financial support, shelter, agricultural aid for marginalised farmers and employment opportunities through cash for work schemes. Its goal is to assist 7,000 households in 6 flood-affected districts from August 2017 to April 2018. Caritas India with the financial support from HCL Foundation is also providing child friendly spaces for schooling after the floods. Under the title ‘My Evening School for Resilience Building’, 12 affected villages with 1000 children have been identified in the Lakhimpur district to help children with their schooling and disaster awareness. “Selected teachers were oriented by Caritas India about their roles, responsibilities and conducting classes for the children to cover their school syllabus and Disaster Risk Reduction aspects,” says Jonas Lakra, Zonal Manager, Caritas India. Twenty-six districts in southern Nepal have been inundated and Caritas is mobilising emergency relief for thousands of people uprooted by the flooding. Caritas has so far reached out to 7,250 families in 11 districts. In Pakistan large swathes of Karachi are underwater due to prolonged heavy rainfall and there were horrifying scenes across the city as cars, motorcycles have disappeared underwater while the bodies of dead animals floated through the streets. Caritas Pakistan has mobilised funds to provide relief to families in the flood-affected slums of Islamabad and Rawalpindi. Trócaire has offered generous support for 300 families and distribution was due to take place in first week of September right after Eid ul Azha. Caritas officials say food, bedding, kitchen items, hygiene and mosquito nets and repellent are urgent priorities for those struggling to survive.